Mozhi starts with some beautifully animated music unfolding across the screen and it’s an excellent lead in to a romantic comedy that never hits a flat note. With a cast featuring Prithviraj, Jyothika, Prakash Raj and Brahmi along with very competent support actors it’s an absolute treat to watch and the story, although simple, provides plenty of scope for their combined talents. There are plenty of genuinely funny moments along with a few tear-jerkers, but it’s the characters and in particular the bromance between Prakash Raj and Prithviraj that really stands out and makes this film something special. The two have great chemistry here and whether they’re at work together or out celebrating, their relationship feels warm and genuine, and this sincerity underlies the entire movie. The film tells the story of the romance between Karthik (Prithviraj) and Archana (Jyothika) but woven through is the relationship between Karthik and his best friend Viji (Prakash Raj) as well as glimpses into the lives of other people in their apartment block. Karthik and Viji work in the film industry under Vidyasagar; also the name of the real-life music director and composer for the film. I love that Tamil cinema uses the film industry as part of the background setting without making it glamorous or over dramatic, but instead portrays the work as just another job – albeit rather a well-paid one. 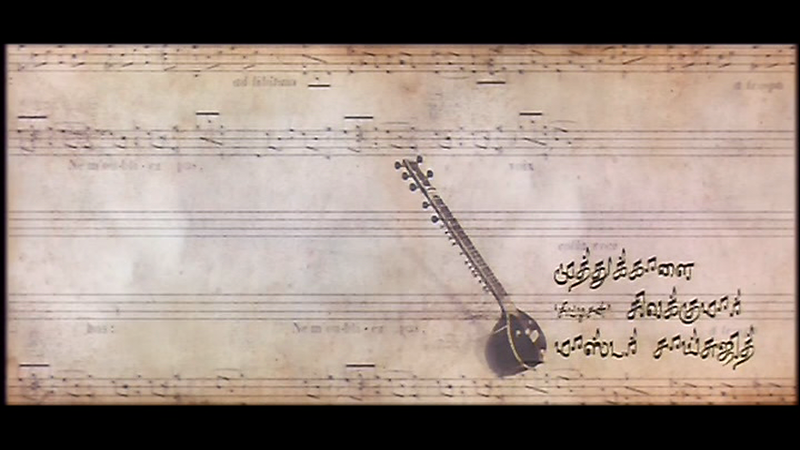 Karthik and Viji are seen adding music to a film clip and director Radha Mohan uses this opening scene to beautifully illustrate the difference when a silent scene is set to music. This becomes significant later on as the story develops and it’s a technique throughout the film to add more depth and layers to the characters. Karthik and Viji move into an apartment together in a block of flats managed by V. Ananthakrishnan (Brahmi), and almost straight away they are at odds with the flat manager as he informs them that bachelors are strictly not welcome. This sets up some of the comedy in the film but for a change Brahmi’s role is fairly substantial and he’s not the main focus of the humour. 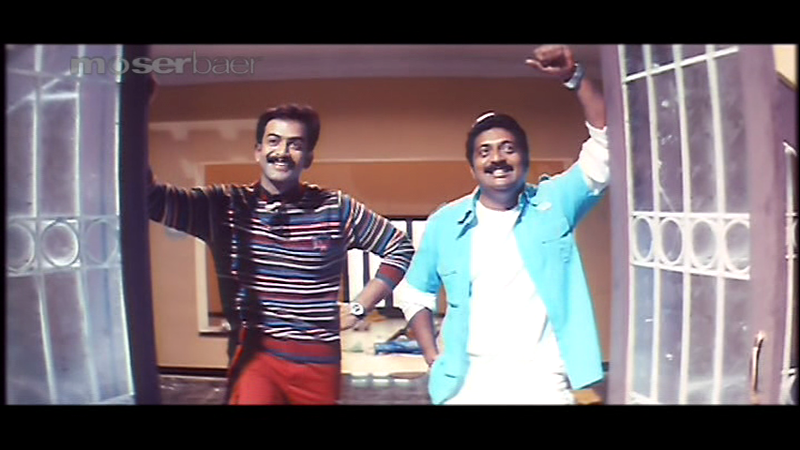 Instead Prakash Raj and Prithviraj handle most of the comedy between them, and they do an excellent job. One of my favourite scenes is where they both repeatedly crack-up in a lift after visiting Brahmi in hospital, but there are so many funny scenes with the two together and they both seem to be having a great time. This is such a good song with both of them dancing and again, they seem to be thoroughly enjoying themselves. Another bonus comedy moment is watching Prakash Raj wearing only a towel dancing in gay abandon to the strains of Hava Nagila,the consequence of which also gave me a new Indian idiom to add to my vocabulary! 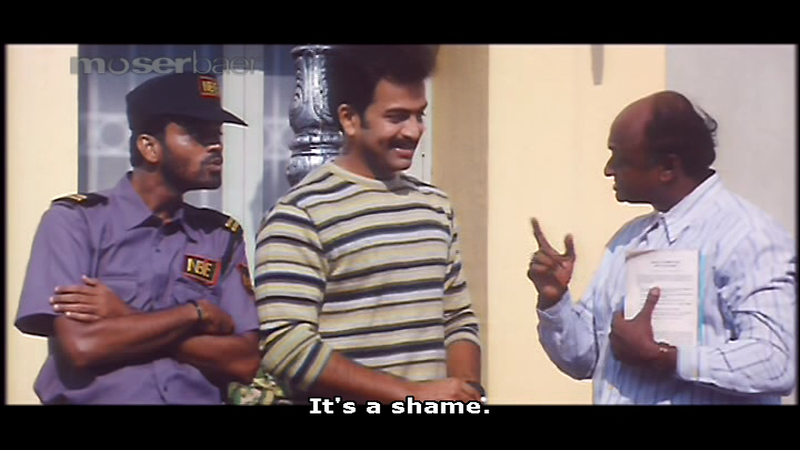 Apologies for the poor quality of the screen caps, but the film quality isn’t great and Prakash Raj just doesn’t stop! Dismayed at the prospect of losing their flat which they have very snazzily decorated with some fantastic sculptures, the two conspire to get round Ananthakrishnan. The obvious answer is for one of the two to get married, but Karthik is a romantic and believes that he will see lights and hear bells when he finds his true love. While Viji is more sceptical he’s not in any rush to get married either so the two try various strategies to ingratiate themselves with the landlord. Along the way they meet some of the other characters in the building and with each vignette more of their personalities are revealed. It makes for an air of realism in the film as the various other inhabitants go about their usual daily routines. The security guard (Balaji), Ananthakrishnan’s level-headed wife Janu (Sriranjani) and his gluttonous son add some more comedy along with Preethi (Neelima Rani) who has eyes only for Karthik. M.S. Bhaskar plays the role of a professor whose mind has been stuck in the eighties since experiencing a personal tragedy and his sad story is used to reveal more of Karthik’s own generous nature. Everyone’s little idiosyncrasies are all used to good effect and each character has something to add to the story. Karthik first sees Archana in the street beating up a vegetable seller for abusing his wife. It’s an unusual introduction and as well as being the only fight in the whole movie, it’s a pleasant change for the hero to admire the heroine’s dishooming capabilities. 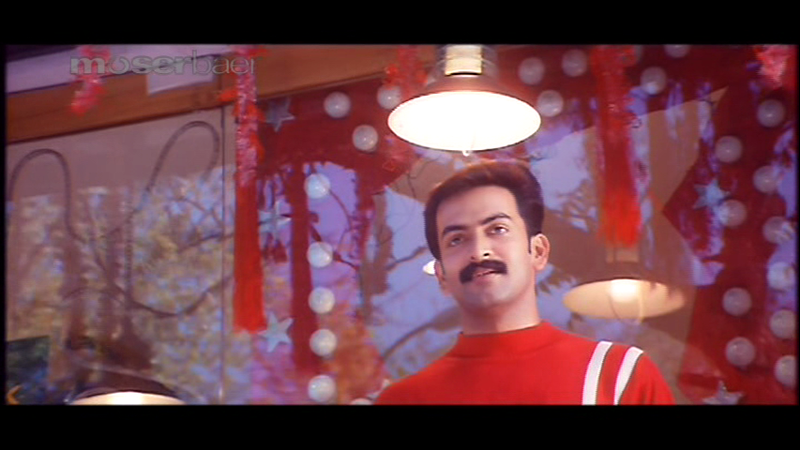 Karthik gets his lights and bells and immediately falls in love with Archana which is one of the few totally filmi moments. After the delight of finding that Archana lives in his block of flats, Karthik discovers that she is a deaf-mute who has a major chip on her shoulder after her parents’ marriage fell apart. In an effort to learn more, Karthik meets Archana’s friend Sheela and learns sign language to be able to communicate. However the path of true love doesn’t run smoothly and Karthik is left teary and broken-hearted as Archana firmly refuses to entertain the thought of marriage. This was Jyothik’s last role before she retired from acting and it really seems such a loss when she brings such a rich characterisation to her role as here. Jyothika uses her incredibly expressive eyes and various facial expressions to convey her feelings and nicely avoids the temptation to overdramatise to get her message across clearly. It’s impressive to watch Archana’s character develop as she doesn’t have any dialogue in the film and everything is communicated by expressions and gestures. And yet it’s clear to see Archana slowly evolves from a very angry and bitter young woman into someone who learns to see past her own insecurities. Karthik tries to understand her world and help her understand his, but since he goes about this by having Viji stuff his ears full of cotton wool it’s perhaps not surprising that he ends up totally misunderstanding her. Apart from her ever present anger and commitment issues, Archana is portrayed as a very normal young woman with a steady job who just happens to be deaf and dumb. It’s a different take on disability and Archana’s perception that she is just a person who ‘speaks’ silence rather than a language of words is interesting. Karthik’s acceptance of Archana with all her flaws and prickly nature is a measure of his maturity and common sense and if his enthusiasm leads him to make mistakes in their relationship, he is able to rethink and change his approach. All of which makes them seem like any typical young couple which makes it easy to understand and connect with their feelings. While Prakash Raj is excellent as Karthik’s friend, Swarnamalya is perfect as Sheela. Her character’s practicality and common sense serve as a contrast to Archana’s more emotional responses but she is still very sweet and looks beautiful as the romance between her and Viji develops. There is so much I love about this film. The characters are wonderful and there are so many well-written scenes with clever and snappy dialogue. The songs are beautiful and this is probably my favourite melody while the picturisation neatly sums up the relationship bewteen Archana and Karthik. Despite only recently having acquired the DVD with subtitles (and a very big thank-you to Temple and Suja for the recommendation), Mozhi has quickly become one of my favourite films and I’ve watched it numerous times already. It’s very funny and it makes me laugh time after time, but there are plenty of poignant moments too which keep the film very balanced. Excellent performances from all involved and an interesting storyline make this a very watchable film that I highly recommend. 5 stars! There are many things I really like about Mozhi, and one is the very appropriate theme of language and communication. Jyothika in particular is wonderful at conveying so much by expression and sign, showing that language isn’t just about words. So there are lots of really nice moments of communication and understanding or misunderstanding. 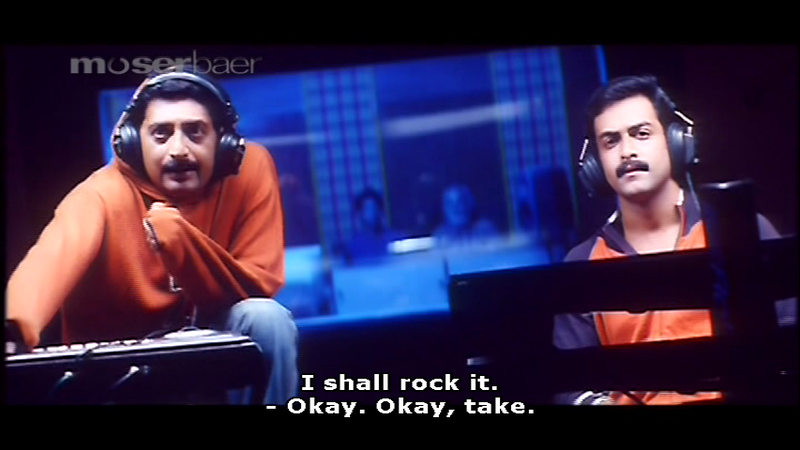 Prakash Raj is a delight, and I always like to see him do a bit more than his usual Prakash Dad or Prakash Bad roles. But this is Jyothika’s film in my opinion. She owns every moment she is on screen, and Archana is such a vivid character as result of her seemingly effortless performance. I was almost annoyed when Archana started to ‘speak’ via voiceover when Karthik found he understood her as she was so good at communicating without words. I’m not convinced by Prithviraj – I find he ranges from bland to adequate, and he only seemed to shift gears in a couple of scenes in this film. Some of my reservations are down to the writing as everything is a bit too neat and too easy for Karthik. He adapts to people’s quirks and differences with barely a pause for breath, everyone instantly believes him and helps him with Archana, he learns sign language very quickly and with few errors, and almost turns into Mother Teresa. Archana’s personality was so complex and real that Karthik was flimsy in comparison, and he didn’t show much depth until quite late in the film. Archana’s friend and colleague, Sheela (Swarnamalya) was a much more interesting character. Archana and Sheela were both bright capable women, and were a good balance for each other. The bromance between Viji and Karthik was a bit hit and miss due to me not finding Karthik particularly believable but has its moments. I was much happier when Viji found someone else to love (even if her wedding outfit was completely hideous)! Unfortunately most of the comedy is dire. I found myself speculating, quite against my will, as to what Brahmi could have seen when Prakash Raj’s towel dropped that would have him almost hospitalised with conniptions. 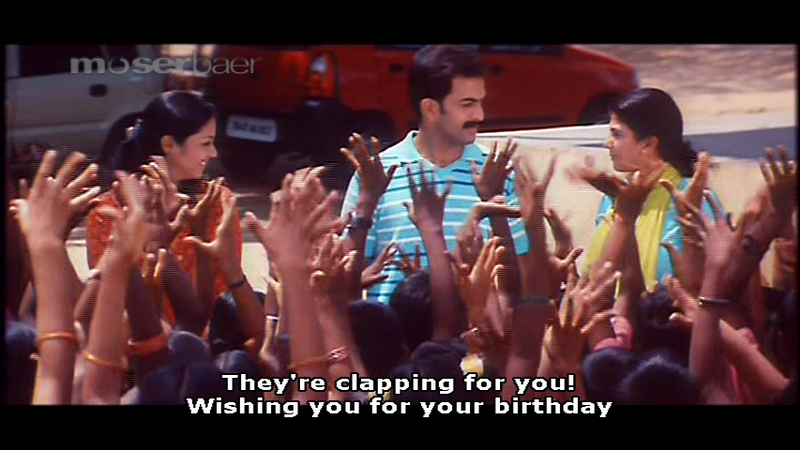 There are fat jokes, Prithviraj hamming it up in a wheelchair and other really dumb schoolboy stuff that was tedious and unnecessary. See it for an interesting story idea, Jyothika in brilliant form, and Prakash Raj kicking his heels up in a fun role. 3 1/2 stars. This entry was posted in Kollywood and tagged Balaji, Brahmi!, Jyothika, M. S. Bhaskar, Mozhi, Neelima Rani, Prakash Raj, Prithviraj, Radha Mohan, Sriranjani, Swarnamalya, Tamil, Vairamuthu, Vidyasagar. Bookmark the permalink. I used to play in an orchestra back in Northern Ireland and spent most of my time either playing music or talking about it, so I found it really easy to relate to the characters here. Prithviraj reminded me of the cellist I used to play with and as you say I felt that I knew him and could understand his enthusiasms. The love of music really came through for me which I put down to the combination of good writing, clear directing and great performances by Prakash Raj and Prtihviraj. I’ve seen a couple of these (there might even be reviews soonish ;)) but will look out for the others. Did you happen to catch the come back of Jyothika in “36 vayadhinile”?